Dean Elbe is a Doctor of Pharmacy and a Board-Certified Psychiatric Pharmacist working as a Clinical Pharmacy Specialist in child and adolescent mental health at the BC Children’s Hospital in Vancouver, BC. He is an international speaker on food–medication interactions and child and adolescent psychopharmacology. Dean’s research interests include developing clinical tools for clinicians and members of the public to obtain factual information about drug interactions between prescription medications and substances of abuse. 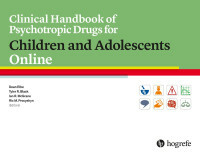 What’s new in the 4th edition of the Clinical Handbook of Psychotropic Drugs for Children and Adolescents? 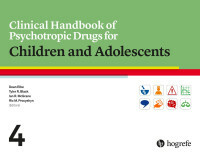 The Clinical Handbook of Psychotropic Drugs for Children and Adolescents (CHPD-CA4) is a unique resource to help clinicians make the right choices about psychotropic medications for younger patients. The fourth edition of this widely acclaimed reference has been fully updated and expanded. Packed with comparison charts and instantly recognizable icons, readers can find the information they need at a glance. We were very pleased to be able to launch the fourth edition at the 65th Annual Meeting of American Academy of Child and Adolescent Psychiatry in Seattle, October 22–27, 2018. The book and the online version of the Handbook were presented at the Hogrefe Publishing stand in the conference hall, where Dean was also interviewed by our Publishing Manager, Robert Dimbleby, and where he held a book signing. Who’s new on the editorial team? Why use the online version of CHPD-CA? What is Dean currently working on? What developments does Dean see coming in the next couple of years? Interview with Dean Elbe – Part 1: What’s new in CHPD-CA4? Interview with Dean Elbe - Part 2: Who's new on the editorial team? Interview with Dean Elbe - Part 3: Why use the online version of CHPD-CA? Interview with Dean Elbe - Part 4: What is Dean currently working on? Interview with Dean Elbe - Part 5: What developments does Dean see coming in the next few years?